Elephants by Rebecca Heller. Illustrated by Suzie Mason. Book Review. I was delighted to receive this book for review just in time for World Elephant Day. This picture book is for preschoolers or very beginning readers. On the left side of each spread are the words “Elephants…” composing either a two or three word sentence. It begins with “Elephants wake.” and ends with “Elephants never forget.” In between they do things similar to humans: bathe, make friends, swim, hug, love, splash, and play. They also do uniquely elephant things: herd, trumpet, and roam. This is an ideal book for pre-readers to memorize and “read”. On the right side of each page are delightful full page illustrations that are basically realistic but have a touch of charm added to the expressions. An adorable baby elephant is featured throughout. 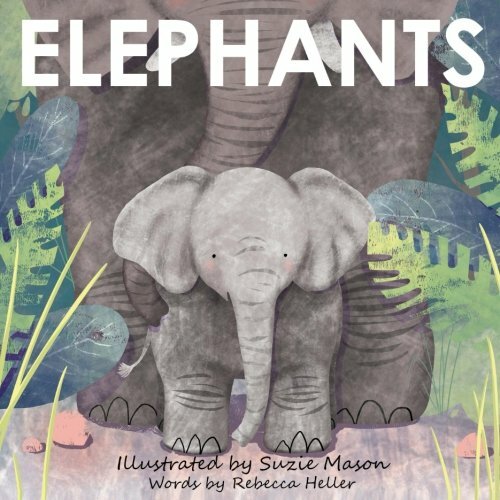 A wonderful book to introduce even the youngest child to elephants and our need to protect them.